One of my biggest bucket list items used to be a visit to Yosemite National Park. I had spent countless hours reading about the park, scrolling through Instagram posts from the park and gasping with excitement any time I unexpectedly ran into a reference to the park. So when I found out that my husband would be attending a conference in San Francisco and I was tagging along, my Yosemite side trip planning began almost immediately. Because I was traveling solo, I hoped to join up with some sort of group or class to meet some people along the way. I found the perfect class from the Yosemite Conservancy. More on that later. 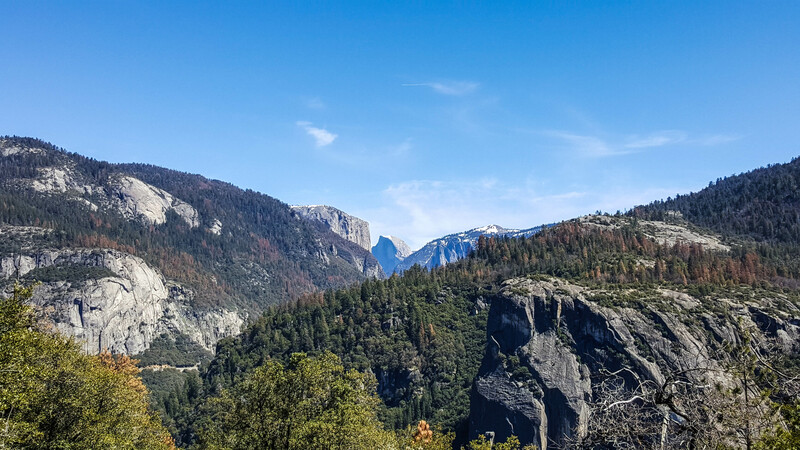 Due to the timing of the class, I had to ditch my plans to take public transportation to the park and was pleased to find out that the drive from San Francisco to Yosemite is only about four hours and rental cars were cheap. As soon as I cleared the SF metropolitan area the drive got exciting. It was a beautiful, warm, sunny day that accentuated all of the natural features around me. Rolling open ranch land kept me company for some time until I reach the Stanislaus National Forest. The landscape became more and more impressive and I had to pull over quite a few times to take in the view, both at developed vistas and wider turn outs. At my first sight of a snow-capped peak very far in the distance I actually shouted with excitement. My first glimpse of Half Dome incited an even stronger reaction. Nearly in tears I made a few more pull-over stops before finally entering the park. I decided to set up my camp first and then try to hit a few trails before sunset. My timing worked out perfectly. I was able to hike Lower Yosemite Falls, hike to Mirror Lake and visit the Welcome Center before dark. Because I was only staying one night, I decided to skip building a fire and whipped up a hot dinner on my camp stove. I should mention that while I had a car, this trip was done more backpacking style, as it was part of a longer two week ATL -> IL -> CA trip and I could only pack a backpack’s worth of gear. It got cold in the Valley, so I turned in pretty early after chatting with folks around the campsite for a bit. Morning view from my tent. Could have done without that RV. My favorite part of any camping trip is that first emergence from my tent early in the morning. The air feels clean and new. The light is beautiful. A new adventure begins. I grabbed breakfast and headed out to meet my hiking group to learn all about the western part of the Yosemite Valley. Most people spend their time in the eastern part of the Valley, so this was a great way to see some less-traveled areas and learn from an extraordinary guide who is the Conservancy’s resident naturalist. The hike was over seven hours of nonstop learning and observing, and I can’t recommend the Yosemite Conservancy’s classes enough after attending this one. Some highlights included El Capitan, a hidden abandoned fireplace & chimney, Horsetail Fall, Ribbon Fall and Bridalveil Fall. Following this all-day hike I returned to my campsite, broke camp and headed for San Francisco. I returned via Hwy 140 (I had entered the park via Hwy 120), a different but still amazingly beautiful drive. There were fewer vistas and places to safely turn off on this return, and I was hoping to hit the freeway by sundown, so I just kept driving. All in all, my entire trip lasted about 42 hours, about 26 of those hours in the park. So if you’re short on time and not sure if the visit is worth it, you can certainly see and do a lot in a day or two. While I covered a ton of ground during my short trip I can’t wait to get back ASAP for a number of reasons. First, the park is gigantic and I need a little more than 24 hours to explore in the backcountry (also, a permit is required). Second, because I visited in the early spring much of the park is closed or inaccessible due to snow cover at higher elevations. Visiting in spring is a wonderful time because the waterfalls are flowing with snow melt (and the summer crowds haven’t arrived yet!). Many of the falls are dry by mid/late summer. However, as seasons change, so does the park, and I would love to see how it differs through the year. Third, I would love to hike Half Dome, but this is another permitted activity and one I should probably train for. And fourth, I’ve got to get my husband there! Words and pictures don’t come close to communicating what Yosemite is really like, and I want him to have the experience of standing nose to nose with El Cap. As a solo female traveler in the park, I felt safe at all times, even in the packed campgrounds. I stuck to hiking trails that were busy, but I imagine if you wanted to be truly alone, even in the front country, it wouldn’t be too difficult. Overall, it was a life changing experience for me, and I would love to hear if you’ve had a similar experience or have visited Yosemite. What did I miss? What should be on the top of my list for my next trip? I’ll be writing a post about each of the three hikes I took in the park as part of my 52 Hike Challenge with more detail and lots more photos so stay tuned for those! Yosemite is one of my favorite places in the world. Thanks for sharing!